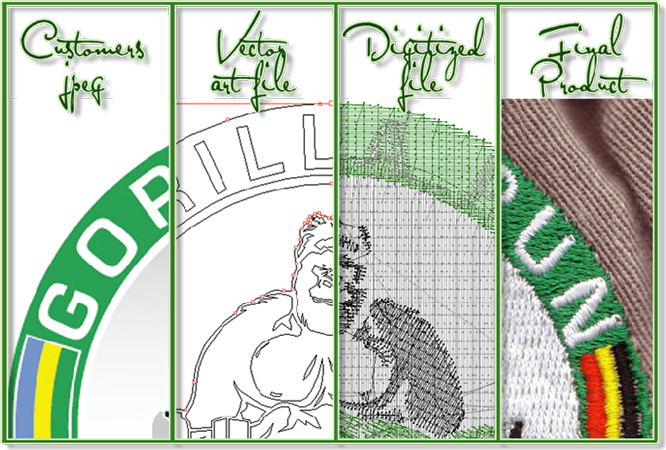 If you’ve ordered custom embroidery before you’ve probably heard the word “digitizing”. What is digitizing? Digitizing is the process of converting artwork into a stitch file that can be read by our machine and interpreted as different stitch types. Is digitizing a “one step”, click the button process? No! First, the digitizer must analyze the artwork to see if it should be edited for embroidery. Not all logos that were designed for a print media such as a business card will work well for this process. Many designs need to be simplified. In addition to correctly sizing a logo, some elements such as outlining may need to be eliminated and small text may need to be enlarged. After the artwork has been modified in graphics program, the file is opened in a software program where it is used as a template for creating a stitch file. Then we must decide how the “pathing” in the logo will run. The pathing is the sequence of stitches in a design from start to finish. Pathing can effect how a design will “lie” when it is finished. If a design isn’t sewn in the correct sequence, you may have unwanted gaps of fabric or uneven text. The pathing will also effect how long the design will run on the machine during the sewing process. Although you may not care what the running time is, a shorter, smoother design will cost you less. Next, We assign stitch types to each section of the design based on what stitches will best represent the artwork. It starts by adding the underlay stitches. Although you can’t see underlay stitches in a finished logo, having the correct underlay stitches is essential to creating a great looking logo. Underlay helps stabilize the fabric to the backing (another essential element in sewing), lay down the nap of the fabric so that the remaining stitches have a smooth surface to add density to the design. Not using the correct underlay can cause the stitches to sink into the fabric or allow the shirt fabric to show through the design. Although there are only three basic stitch types: run, satin and fill stitches, there are variations of these stitch types. For example, fill stitches are used to cover large areas; but, the digitizer must decide what type of fill stitch to use, the direction of the fill and where the fill should start and stop in the design. When making these decisions you must consider what type of fabric the logo will be sewn on and make appropriate adjustments. Stitches will sink into fabrics such as polar fleece and lay on the surface of denser fabrics such as nylon. A logo that was originally digitized for denim, a fabric that allows stitches to lay on the surface, won’t look as good when finished on a pique knit where the stitches sink into the fabric. Another important aspect is the “push and pull”. A design may move while being embroidered. This will cause some stitches to shrift. This shifting can occur when using bulky fabrics, long stitches, large areas of thread and a tight bobbin thread. We must account for the possible effects of push and pull on a design and make adjustments to compensate. 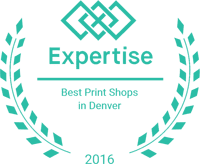 Although many left chest business logos are fairly easy to digitize, designs with fine detail, small text and lots of color changes require more set-up time. Digitizing is a careful process that requires time and experience to be performed correctly. The digitizer must know how the stitches he sees in his software will work on different fabrics. A well digitized design will enhance your logo so look for an embroider who provides quality digitizing. Again, As with all things at Choice Image, Inc. we do all our work in-house. This gives us total control and quality assurance over the entire process. We gladly use an other shops punch tape or digitize file because we have the flexibility to edit it on the fly. Having the ability to digitize your art, logo, design or typography in house gives us control over both the price ( Which is determined by stich count) and the quality of the actual sew out. There is an art to the process and it varies from product to product, From hats stretching the stich or sew from an circle into an oval to sewing on products like fine leather that may actual perforate, cut and destroy the garment. We are masters of the art and practice our fine craft and years of experience an every item we produce. In order to start we need to see your logo and or artwork. Fill free to upload your image and get a FREE quote on the right. What service would you like a quote for? What types of items would you like printed or embroidered? How many items would you like printed or embroidered? If you have art, you can include it for upload here.